Ever have one of those sessions where everything is going wrong? What, not the way you would expect this blog to start? Well let me tell you a little story. 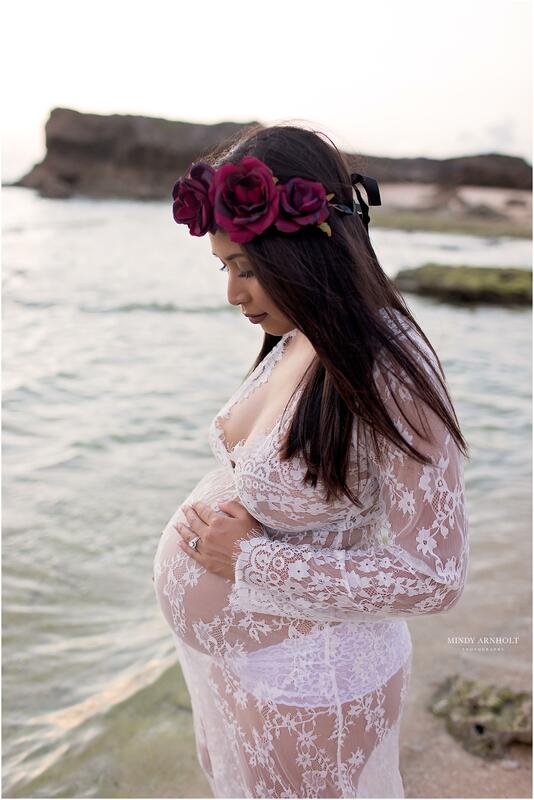 I have been looking forward to Arunie’s beach maternity session since before she was even showing. I had it all planned out in my head. She was going to wear this beautiful white lace dress that had been hanging in my dress closet for ages just waiting for the right mama to come along. She and that handsome husband of hers would be glowing and lovely and wonderful.The sunset was going to be epic. I already knew how it would go. I just had to find the right location. As fate would have it… the night before their session a friend took me to this hidden little spot for a photo shoot of my own. It was perfect. An absolute gem of a beach. We were the only people there, it had a beautiful cliff over the water… it even had a soft sand beach, which is a pretty rare find among the coral beaches of Okinawa. I knew without question, it would be the perfect spot for my beach maternity session the following night. I asked her very sweetly if I could borrow her secret spot, and she laughed it off saying she didn’t own it. Fast forward 24 hours. I arrived early. I was stoked. But as I weaved down the narrow rock path that leads to this “secret beach” I noticed that something was wrong. There were 11 (I counted) ELEVEN cars lined up in what was supposed to be an empty field. This did not bode well for what I would find on my empty secret beach. I walked down, and sure enough, there were HOARDS of people camped out all over the small sandy beach. There were clothes hanging from the trees to dry. There were heaps of snorkels and fins. There were somewhere between 20-30 stand up paddle boarders just around the rocky corner at another better-known beach that I avoid for that very reason. This was NOT going according to plan. I only had minutes before my model-worthy clients were going to arrive, so I frantically started texting my photographer friends. “WHERE CAN WE GO?!? !” The answer was: nowhere. It was a beautiful Sunday night in August and every beach (even my perfect little secret beach) was going to be crawling with people. By the time Chance and Arunie arrived, I was completely frazzled. I apologized for the people, but they weren’t phased. I suppose they had expected that there might be other humans at the beach on a beautiful night. We worked around them. We adjusted as necessary. About twenty minutes into the session a Chinese kayaking tour started paddling toward us. At this point, I wasn’t frazzled… it was just funny. What were 15-20 more people? We laughed as they docked their kayaks all over the beach and climbed the cliff to take selfies. “I can photoshop his bum out,” I told them as I posed them in front of a man bending over to get a better angle of the sun. The shoot did NOT go according to plan. But, just before sunset, the kayakers headed back out to sea. The people took their, now dry, clothes off of the trees and went back up to their cars. The paddle boarders all sank (well, probably not, but they did disappear off somewhere when I wasn’t looking). The cars drove away, and the beach vacated. And you know what? This all-wrong session turned out to be one of my favorites of 2017. She wore that beautiful white dress. And she and that handsome husband of hers were glowing and lovely and wonderful. And the sunset did, in fact, turn out to be epic.